The most money raised for ASCA fundraiser, we topped $50,000 in donations and funds raised! Funds raised in a year top $200,000 in 2015. Funds raised exceed $150,000 a year for the first time. $58,000 raised for bolt-replacing experts at ASCA. Expanded gifts of $10,000 or more to include five separate organizations. This year marked the beginning of our annual gifts to the Yosemite Conservancy, which goes along with trail-building efforts by staff. 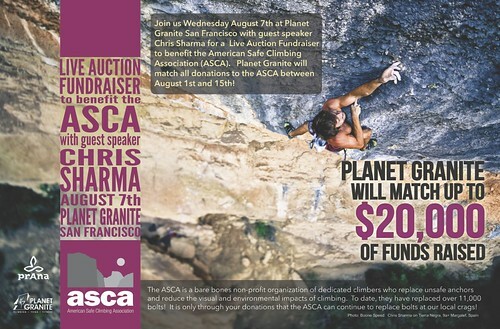 Broke the $100,000 raised milestone through pledges to preserve Portola and Castle Rock, along with money for the ASCA, ETC, and the Sharma Fund's work bringing kids outside to climb. PG founded, works with Santa Clara Firefighters to bring local Sunnyvale and Santa Clara elementary schools to the gym to climb, learn leadership skills, and bond with first responders. This initiative continues to this day. Welcomed underserved youth to our gym to train with Environmental Travel Companions and other non-profits, beginning hundreds of hours of facility use and in-kind donation that have continued for more than two decades. Save Donner Summit, which raised a total of $88,000! Planet Granite's donation and money raised amount to ~one third of the total used to save Donner, and we are proud to have been the biggest corporate sponsor. We're even prouder that PG's community stepped up to more than double what we donated in matching funds. 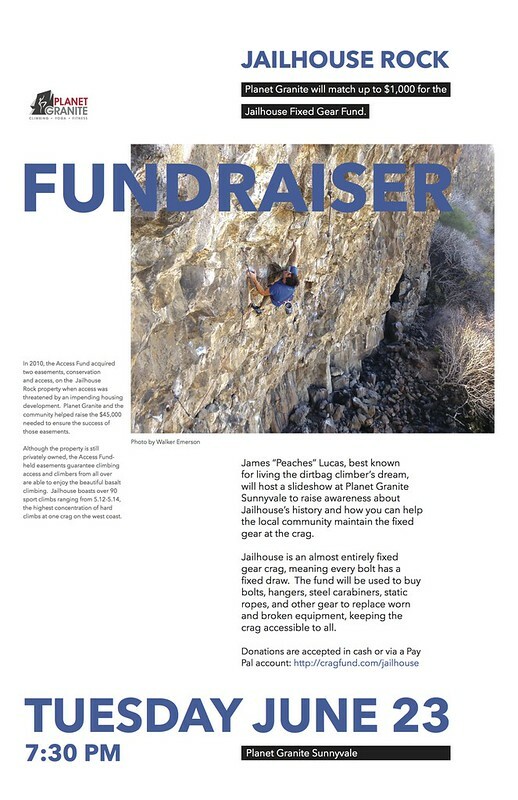 Raised $23,000 to preserve climbing access at local crag Jailhouse, raised total donations and money raised to $59,000. Donated $10,000, raising $20,000 for the American Safe Climbing Association, beginning our tradition of raising funds for the crucial cause of replacing outdoor bolts and anchors.